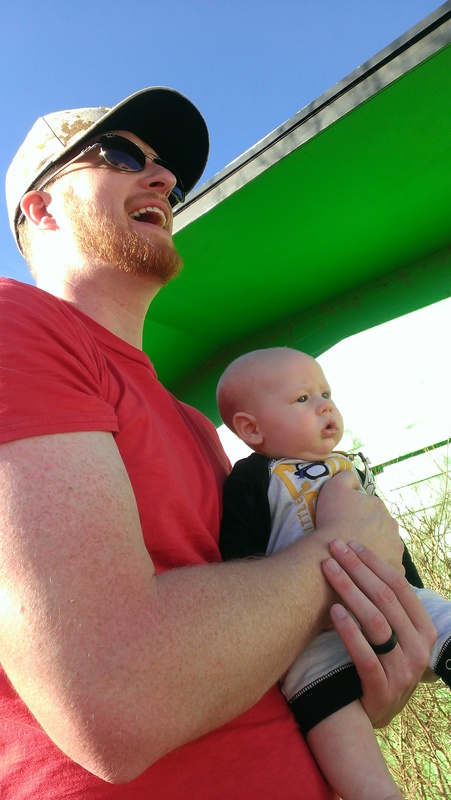 Last March, Ben and I took an awesome “beercation” to Colorado. 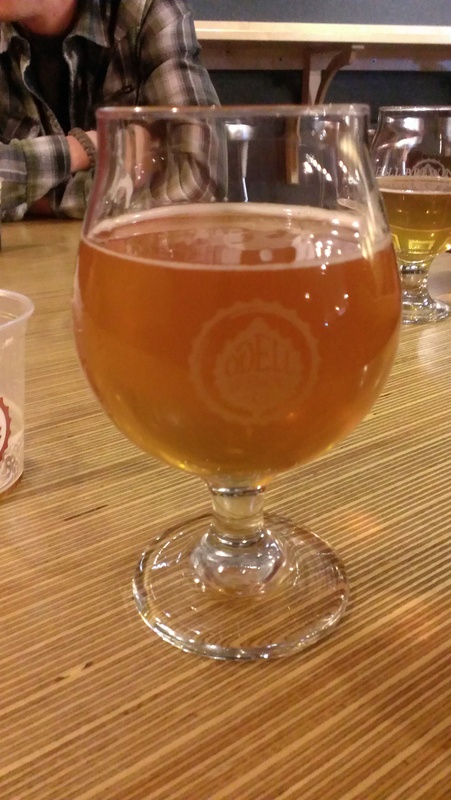 I posted part 1 and part 2 after the trip and slacked off on updating brewery visits after that. Better late than never, right? Here is part 3 of 4, to be followed by the rest of the brewery reviews I missed from elsewhere in the U.S.! We hit up Fort Collins Brewery for lunch! (And beer. Duh.) We visited and stayed with some friends the night before, and they came with us to brewery-hop! Baby in tow! We weren’t sure at first if we were going into the right place or not. The sign on the door of the building that, elsewhere, was branded as Fort Collins, read “Gravity 1020 Modern Tavern”. Weird. But when we walked in, everything was branded as Fort Collins, and we saw the brewery, so we knew we made it to the right place. It looks as if they’ve since re-branded “Gravity 1020” as FCB (Fort Collins Brewery) Modern Tavern. I think that was a good move! This was a big, wide open space, with plenty of tables and chairs, and some tasty food. 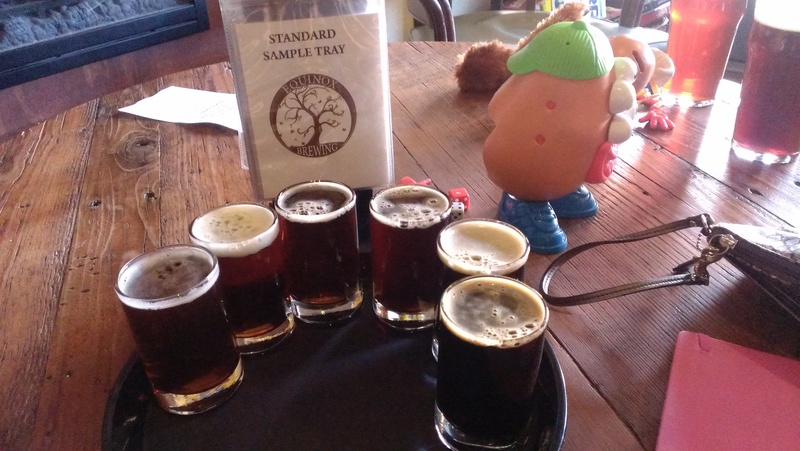 I tasted 5 beers, and my favorite was the Out Of The Ashes Smoked Marzen at 4.5 stars! All of the beers were well done, but I had one complaint. They had a beer called Sweet Tart Pomegranate Stout. It wasn’t a sour beer. Mildly disappointing. Aside from the 2 identity/naming issues, this was still a solid brewery with solid beer. New Belgium deserves an entire post to itself! Hands down, this is the most fun brewery I’ve ever been to. Working in the beer industry would be enough to make most people more than happy with their career path, but these people who work there… They have this charisma. It’s almost something you can’t even pin down. Like a sparkle in someone’s eyes. (There’s always a chance that was just the beer talking, but follow along with me, people!) These are more than happy people. These are fulfilled people. I think it’s truly rare to find a company that encompasses such a passion, a compassion and willingness to give, and vested interest in its people, like New Belgium does. 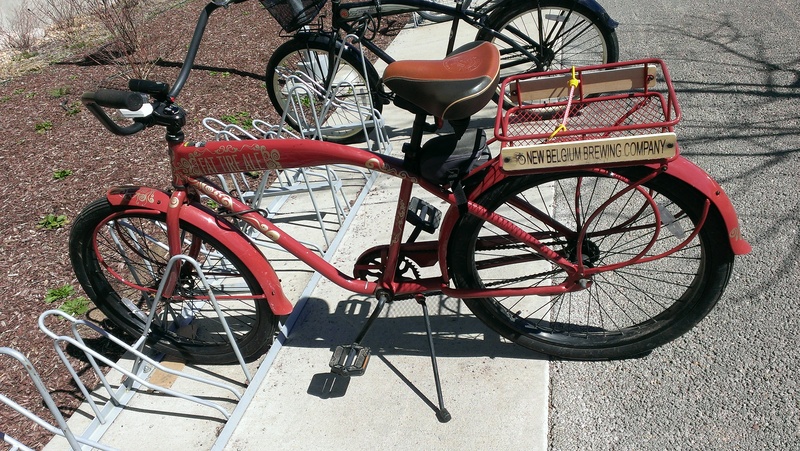 For employees one year anniversaries, they get a coveted New Belgium bike! (You can’t purchase these bikes. They’re really only given to distributors and employees!) Stick around for 5 years, and you get an all-expense paid TRIP TO BELGIUM. They have fun things all over the grounds of the brewery for employees to use in their spare time, like a foosball table, pool table, ping pong table, and rock climbing wall. They even occasionally get some paid time off if they take a vacation to volunteer or do something charitable. The grounds of the brewery are amazing, and you really get the vibe walking around that it’s such a fun place to be. They don’t seem to take things too seriously, and I think that’s really what makes craft beer what it is. New Belgium does at great job at making work fun to these people, and they do a great job in making the brewery a fun place to visit. The grounds are full of different buildings housing different parts, and the grounds are sprinkled with bike racks and beautiful bikes from the employees who ride to work every day. We took the tour, which was about 2 hours long. There are many breweries where I would advise you to skip the tour. This is definitely not one of them. Our tour guide was great! I wish I could remember his name. He brought so much excitement to the tour. One of my favorite parts of the tour was walking into the foeder storage room! It was like a jungle of foeders! 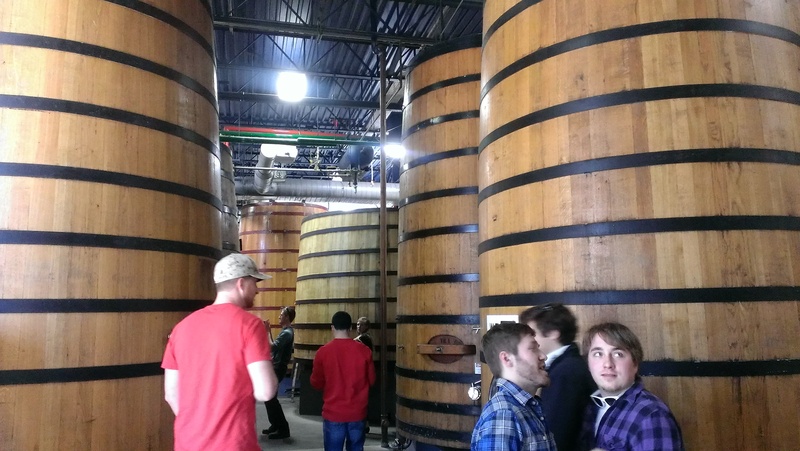 (A foeder, pronounced “food-er” is basically a giant wooden barrel that was previously used at a winery. Foeders are used by brewers to create sour beers or wild beers! These are truly things of beauty!) In the fooder storage area was a little bar where our guide poured us some NBB Love Oscar! I could have stayed in there all day to drink that beer. My second favorite part of the brewery was the slide at the end on the way out! You could also opt to use the staircase to get downstairs. But why would you do that when there’s a perfectly good corkscrew slide there for you to use? You really can’t go wrong with any New Belgium beer. They just don’t put out bad stuff. They have amazing sours like La Folie and Le Terroir, which are my favorites from them. Other fun fact: New Belgium’s flagship beer, Fat Tire, is my favorite beer to recommend a newbie. It’s a solid, approachable amber ale, and I always get great feedback when I get someone to venture away from those light, fizzy, yellow beers and try it! Another great stop and another solid brewery. We took the tour here. 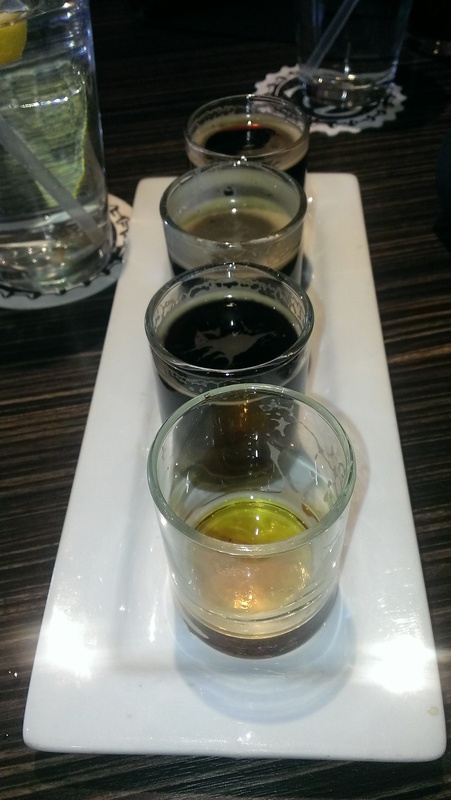 I had the Mountain Standard Double Black IPA (3.5 stars) and the Tree Shaker Imperial Peach IPA (4 stars). Many brewers practice sustainability and try to recycle and reuse as much as possible, but this is the only brewery I know of where they named a beer after the farmer who comes to the brewery with his truck to pick up the spent grains for his cows. The Chocolate Milk Stout is named after Lugene, who for many years has been helping the brewery unload their spent grains. Out tour guide said he’s a humble guy who is a little on the reserved side. When he comes into the brewery to get a growler, he never asks for a Lugene, but instead calls it the Chocolate Milk Stout. The brewery and tap room aren’t that big, but there was a fun grassy patio area outside with picnic benches and corn hole! 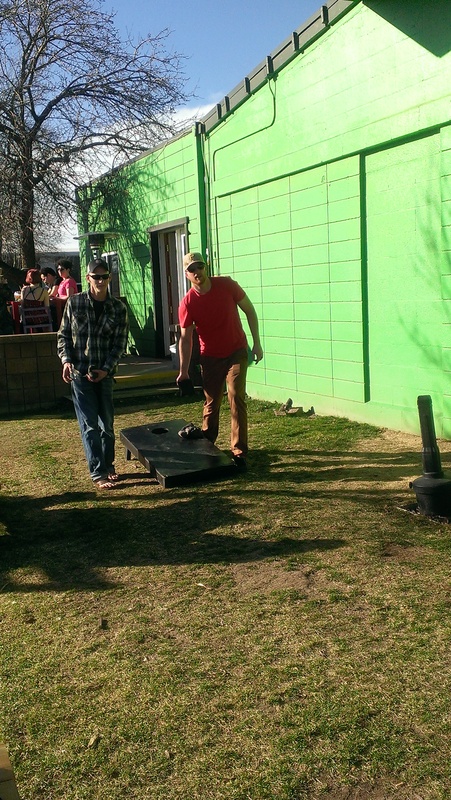 It was a beautiful March day, so we played corn hole in t-shirts and tank tops and had a blast. I also had the Session Saison (3.5 stars), the Raspberry Provincial (4), the Saison (3.5), and Solenna (4.5). I also had to pick up a shirt from the brewery before we left. It has an arrow with the word “enjoy” written inside it, pointing to this cute little tulip glass with a smiley face on it and an “x” over one eye. It’s the little things that make me happy! It was past time to refuel with some food, but we had one brewery to go for the night before we binged on burritos and stuffed ourselves too full to drink. This was a fun place. It was packed, but somehow, we snagged a decent-sized round table to sit at and enjoy some beers. Our friends and their baby were still along for the ride. There were board games on a little bookshelf, and I remember this Mr. Potato Head that was sitting there. We played with him a bit. I was apparently pretty thirsty. I had a flight and checked into 5 beers there. I rated 3 of them. Sudden Valley (4 stars), Haver Scottish Ale (3.5), and Eclipse Brown (3.5). And that was it for the night (after we hit up an amazing little burrito spot nearby). The next day was my birthday, and I needed to rest up!